The Jurassic Park franchise has been on a rough journey ever since the first film. Steven Spielberg’s original was a classic, ground-breaking film, but his follow-up The Lost World was a disappointment and Jurassic Park III limped into cinemas with no reason to exist. Afterwards, the franchise went into dormancy, only to return in 2015 with Jurassic World, which resurrected the series and made over a billion dollars worldwide. But whilst Jurassic World was a success financially, critics were divided on the quality of its characters, storytelling and perceived sexism. Director Colin Trevorrow moved on to make the colossal failure The Book of Henry, with J.A. Bayona (director of The Orphanage and A Monster Calls) taking the reins for the next film. Despite this change, Jurassic World: Fallen Kingdom is another weak entry in the series. Set three years after Jurassic World, Claire Dearing (Bryce Dallas Howard) is working for the Dinosaur Protection Group, when she is contacted by Eli Mills (Rafe Spall) who says that his organisation is putting together a mission to save the dinosaurs from Isla Nubar, which is about to be destroyed by a volcano. She informs former love interest Owen Grady (Chris Pratt) of the mission and that he must rescue Blue, his only remaining pet raptor. Once they get to the island with Zia Rodriguez (Daniella Pineda) and Franklin Webb (Justice Smith), they soon realise that the people running this operation have different plans. One issue that this sequel resolves from the previous film is Claire’s character. She’s more likeable this time and the sexist writing that defined her previous arc is largely non-existent. There’s a great moment where a villain calls her out for causing the conflict of both films, which seems to echo criticisms of the previous film that she was unlikeable and should have been held more accountable for what happened. The opening is also excellent, a moody and suspenseful prologue that grabbed my attention. But from that point onward, the weaknesses in the storytelling began to show. Despite a new director and the promise of something different in this new entry, Bayona is unable to take the series in any major new direction. The formula remains unchanged, especially with the plot hitting a lot of the same beats as the previous film. Even the central moral conflict is just fodder for the same anti-greed message. The only time the central moral quandary of saving the dinosaurs or letting them die is properly dealt with is at the end, but all it amounts to is a sequel hook. There are also frequent gaps in logic, such as: a secret lair with no security, a character forgetting to lock a cage with a raptor inside, a tranquillised Owen rolling away from lava, and a T-Rex roar that gets no attention. The story even has a twist regarding one character that was eye-rolling and preposterous, as it took the series further away from reality. As for the characters, Claire, Owen and everyone else are just along for the ride and do not go through meaningful arcs. Even Owen’s relationship with Blue, a raptor he trained, fails to evolve and ends the same way as before. By the way, do not get excited for Jeff Goldblum’s return; he only appears in 2 scenes, clearly filmed in a day and his signature quirks are replaced with generically ominous lines. The writing also affects the actors, who are either over the top or standard. Toby Jones as an auctioneer, Ted Levine as a mercenary and Rafe Spall as the leader all camp it up. They put on bizarre sounding voices and overemote, never being threatening or realistic. 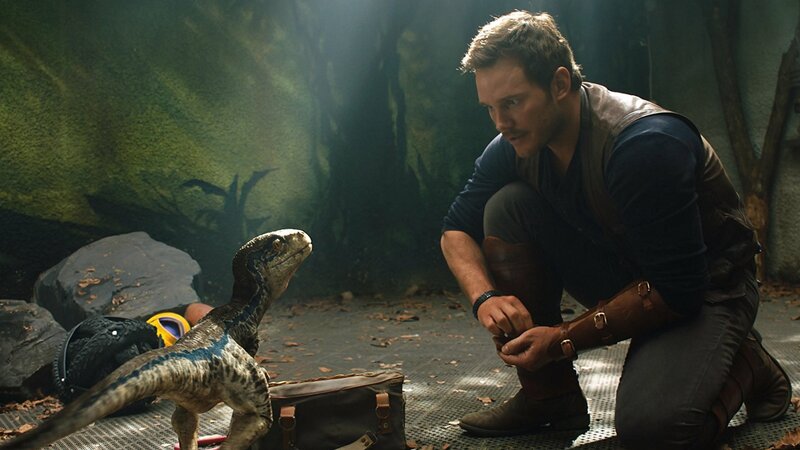 Chris Pratt and Bryce Dallas Howard are always good, but they still lack chemistry together and neither actor brings as much energy as they did to their roles in the previous film. Justice Smith and Daniella Pineda are saddled with comic sidekick roles, though at least Pineda is likeable and useful compared to Smith, who spends the entire film yelling and generally being unfunny. J.A. Bayona’s direction is certainly good, with the best moment being an underwater escape shot in one take. Most of the action is well filmed, the effects are mostly convincing and Michael Giacchino’s score is entertaining. He also keeps the pacing fast, which prevents the film from becoming a total slog, despite the 2nd half’s setting getting somewhat stale as the film continues. However, the direction clashes with the tone. Whilst Bayona attempts to mine tension out of every scene, it all comes across as incredibly silly. A scene with a raptor breaking the 4th wall should not be in a film attempting to be an ‘Empire Strikes Back’ style sequel. I was laughing in many scenes and I do not know whether I was supposed to be. In conclusion, Jurassic World: Fallen Kingdom shows the series continuing to head in dumb directions. It is admittedly very entertaining in how ridiculous it gets, but if you are looking for the franchise to be brought back to greatness, then you’ll be disappointed.